Product Description: Model 2755 Measures resistances from the 100 m Ohms to the 110M Ohms Range by operation of switches. Batteries and the Galvanometer are self-contained, for your safety. 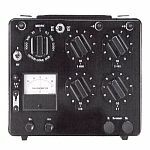 The Front Panel is provided with power and galvanometer circuit selectors, One ratio arm dia, and four measuring arm dials. Model 2755 is also equipped with a Murray and Varley Loop tester for convenient location of line faults such are "shorts" and "Grounds" in power, telephone, telegraph, and signal cables. Can be used as 5-dial decade resistance box. Galvanometer (built-in) Sensitivity approx. 10microV/div.